In total, Dr. King has published more than 100 peer-reviewed scientific papers and more than 250 scientific abstracts. 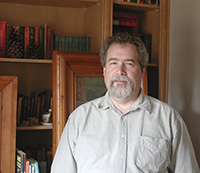 In addition, he has worked as a consultant to the publishing industry as an editor and writer. He has written extensively on geology and geological education for general audiences and regularly gives public lectures. He regularly teaches introductory, advanced, and graduate courses in geology and he has supervised 25 Master’s students in geology. He is also Director for the Concepts of Science program on the Auburn main campus and has campus leadership experience as an officer since 2006 in the local AAUP (American Association of University Professors) chapter and as Chair of key campus Senate committees. For more information about his work, please see his web page at http://www.auburn.edu/~kingdat. University of Missouri-Columbia, Ph.D. in Geology, 1980. University of Houston, M.S. in Geology, 1976. University of Louisiana at Monroe, B.S. in Geology with honors, 1972. 1980–date Faculty Member, Dept. of Geology-Geography, Auburn University. 1976–1980 Graduate Teaching Assistant, Dept. of Geological Sciences, University of Missouri-Columbia. 1975–1976 Laboratory Geologist, Getty Oil Company E&P Laboratory, Houston. Sedimentology, stratigraphy, and petroleum and impact geology. Field experience: U.S. Gulf Coast and Texas; Mid-continent U.S.; New England; Belize and adjacent parts of Mexico; southern Africa. *Geological Society of America–Co-Editor, Session Chair, Field Trip leader. *Board Member, Alabama Board of Licensure for Professional Geologists (2005–date). *Member, North American Commission on Stratigraphic Nomenclature (1997–2000). Wartho, J.-A., M. C. van Soest, D. T. King, Jr., and L. W. Petruny, 2012, An (U-Th)/He age for the shallow-marine Wetumpka impact structure, Alabama, USA: Meteoritics and Planetary Science, v. 47, p. 1243-1255. King, D. T., Jr. and J. Ormö, 2011, Wetumpka—a marine target impact structure examined in the field and by shallow core drilling, in Garry, W.B., and J.E. Bleacher, eds., Analogues for planetary exploration: Boulder, Colorado, Geological Society of America, Special Paper 483, p. 287-300. Ferrell, R., D.T. King, Jr., and L.W. Petruny, 2011, Nontronitic clay pseudomorphs of Cretaceous-Paleogene (KT) microtektites, Shell Creek, Alabama, U.S.A.: Journal of Sedimentary Research, v. 81, p. 348-354.
de Villiers, G., D.T. King, Jr., and L.J. Marzen, 2010, A study of candidate marine target impact craters in Arabia Terra, Mars: Meteoritics and Planetary Science, v. 45, p. 947-964. King, D. T., Jr., and L. W. Petruny, 2008, Impact spherule-bearing, Cretaceous-Tertiary sand body, Shell Creek stratigraphic section, Alabama, USA, in Evans, K., et al., eds., The Sedimentary Record of Meteorite Impacts: Geological Society of America, Special Paper 437, p. 179-188. King, D. T., Jr., L. W. Petruny, and T. L. Neathery, 2007, Ecosystem perturbation caused by a small, Late Cretaceous marine impact, Gulf Coastal Plain, USA: in Monechi, S., R. Coccioni, and M. R. Rampino, eds., Large ecosystem perturbations: causes and consequences: Geological Society of America, Special Paper 424, p. 97-107. King, D. T., Jr., J. Ormö, L. W. Petruny, and T. L. Neathery, 2006, Role of sea water in the formation of the Late Cretaceous Wetumpka impact structure, inner Gulf Coastal Plain of Alabama, USA: Meteoritics and Planetary Science, v. 41, p. 1625-1631. Pope, K. O., A. C. Ocampo, A. G. Fischer, F. J. Vega, D. E. Ames, D. T. King, Jr., B. W. Fouke, R. J. Wachtman, and G. Kletetschka, 2005, Chicxulub impact ejecta deposits in southern Quintana Roo, Mexico, and central Belize: in Kenkman, T., F. P. Hörz, and A. Deutsch, eds., Large Meteorite Impacts III: Geological Society of America Special Publication 384, p. 171-190. King, D. T., Jr., and L. W. Petruny, 2003b, Stratigraphy and sedimentology of Cretaceous-Tertiary boundary breccia deposits at Albion Island, Belize, in Koeberl, C., and F. Martinez-Ruiz, eds., Impact markers in the stratigraphic record (Impact Studies): Berlin, Springer-Verlag, p. 203-228. King, D. T., Jr., T. L. Neathery, L. W. Petruny, C. Koeberl, and W. E. Hames, 2002, Shallow marine-impact origin for the Wetumpka structure (Alabama, USA): Earth and Planetary Science Letters, v. 202, p. 541-549.